a glimpse of our life: Markers That Don't Dry Out! Markers That Don't Dry Out! 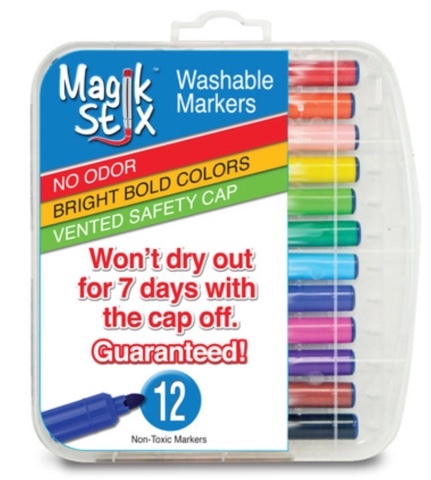 The following is a review of Magic Stix Washable Markers from The Pencil Grip, Inc.
We've had this 12-pack set of Magic Stix Markers for over a month now, and they are just as vivid as when they were brand new. Have you done it too...grabbed a marker only to learn it was too dry to mark your paper? We have gone through so many that dried out even with the lids firmly in place. These Magic Stix are different. They have a vented safety cap which means technically, in addition to being safe for young kids, they are also never completely air tight even with the lid on. They also have a handy case with a spot for each marker to conveniently snap into. Another feature especially helpful for sensory defensive kiddos is that these markers have no odor! That's a big deal! I've had patients who couldn't handle the scent of shaving cream used in sensory activities, and you know many typical markers have a much stronger scent than that. The bright classic colors are also non-toxic. A lot of attention to detail obviously went into the Magic Stix formula. 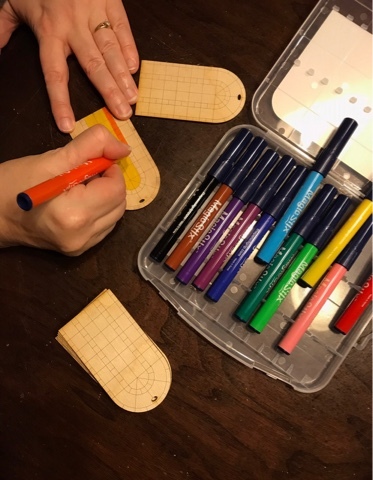 We used these on both paper and wood projects. The colors did go through thin paper but work great with cardstock. On wooden ornaments, they showed up very well. They are now also available in a 24 pack, too! Disclosure: The Pencil Grip, Inc. provided a set of their Magic Stix markers for this review. All opinions shared are my own. This is a great invention - no scent, and they don't dry out!? Could have used these when my kids were little! We LOVE that these markers don't dry out. Way to go Magic Stix! We love them too! I like the lack of odor and the little carrying case! Wow, they don't dry out? Nice!